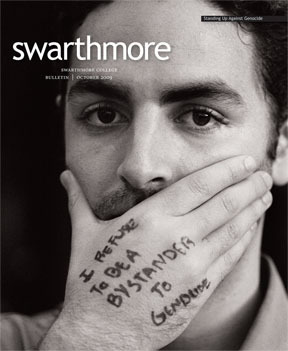 The Bulletin’s coverage of Swarthmore’s adoption of the Phoenix as the College mascot (“Swarthmore Hatches a Big Red Bird,” July 2008) was enjoyable to read, yet one important fact was missing: Kyle White ’08, mentioned briefly in the article as an emcee of the competition to pick a person to wear the costume, was the driving force behind the mascot from the very beginning. As the president of the Garnet Club, created in 2004 to promote school spirit, Kyle approached the Student Athlete Advisory Committee (SAAC) with his idea for a mascot. SAAC encouraged Kyle and convened a subcommittee that included Kyle, SAAC members, and faculty. From that committee came a variety of mascot ideas, which were then voted on by the student body. From the beginning to the end of the process, Kyle’s work was the reason we now have the Phoenix as our mascot. He should be commended for his efforts. Editor’s Note: In photos of the Phoenix on the cover and within that issue of the Bulletin, the mascot costume is inhabited by none other than Kyle White ’08, who indeed deserves great credit for the existence and popularity of Swarthmore’s mascot.